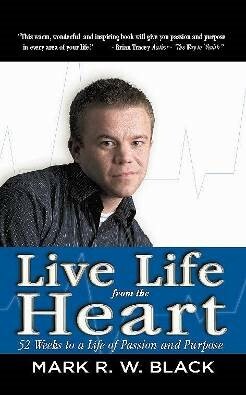 Author Mark Black Spreads His Inspirational Message with the New Book "Live Life from the Heart"
After overcoming incredible odds, Black shares what he learned in this guidebook for life. Canadian author Mark Black is a speaker, author, and life strategy coach who is spreading the message of his book "Live Life From the Heart" around the world … with the help of his publisher Strategic Book Group and its subsidiary Publish on Demand Global (PODG). At age 24, Mark Black lay in a hospital bed waiting for a miracle: He needed a heart and double-lung transplant. From this came a life-changing transformation that led him to recognize the importance of living every day with passion, purpose, and fulfillment. He received his gift of life from an anonymous donor. Since then, Black has given back, becoming a marathon runner, author, and motivational speaker. His life has new purpose: inspiring others to live life to the fullest. The author's message is universal, and with the vast reach of PODG, Black’s life-changing book has achieved a global presence. Through the publisher’s program “Sell Your Book in 10 New Countries - PODG International Book Rights & Distribution for 2016,” authors like Black participate in book fairs in major cities around the world and have the opportunity to reach readers globally. 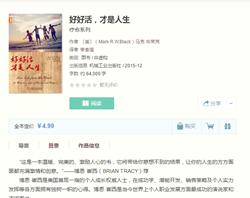 The author's book has been translated into Chinese and is for sale throughout mainland China. Black overcame incredible odds and wanted to share what he learned by writing a guidebook for life. His book is divided into 52 easy-to-read chapters that give goals to readers every week of the year, telling them how to set goals, alter habits, and discover hidden potential. “This truly inspiring book is selling throughout the world. Its message is global and we are proud to make it happen,” said Robert Fletcher, CEO of Strategic Book Publishing and Rights Agency. About the Author: Mark Black is a writer, motivational speaker, and founder of his own speaking/consulting firm. He has mentored thousands of individuals, speaking at educational institutions and corporations across North America since 2002. The author is currently working on his second motivational book geared toward young adults. He lives in Canada. http://www.strategicbookpublishing.com/LiveLifeFromTheHeart.html or at Amazon, Barnes and Noble and other online booksellers.. WHOLESALERS: This book is distributed by Ingram Books and other wholesale distributors. Contact your representative with the ISBN for purchase. Wholesale purchase for retailers, universities, libraries, and other organizations is also available through the publisher; please email bookorder(at)sbpra(dot)net.